Midway through its 40th anniversary year, the Upstairs Artspace in Tryon sponsors three new exhibits for 10 artists well established in the Carolinas, the Southeast and throughout the United States. 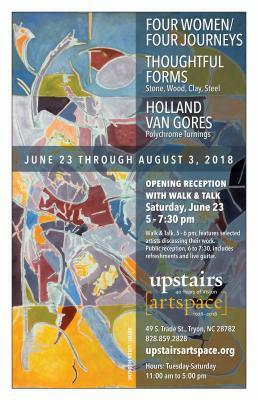 Opening date is Saturday, June 23, with a "Walk & Talk" by the artists, 5 - 6 p.m., and a public reception , 6 - 7:30 p.m., with refreshments and live guitar. "Four Women/Four Journeys" presents abstract and impressionistic paintings by Bonnie Bardos, Saluda, Patricia Cole-Ferullo and Linda Hudgins, Tryon, and Carol Beth Icard, Landrum SC. The women typically express their spiritual and mental journeys through a bold, beautiful and colorful art. All are widely exhibited in regional galleries and private and public collections. "Thoughtful Forms: Stone, Wood, Clay, Steel" showcases exciting floor and wall sculpture by Mark Gardner, Stoney Lamar, Dale McEntire, Shane Varnadore, Dale Weiler and David Zacharias, all residents of Polk County. Gardner and Lamar are nationally known and celebrated wood-turners in major museums, galleries and collections. Varnadore is fast growing his reputation as a turner. McEntire and Zacharias, acclaimed artists and art teachers, sculpt thoughtful, powerful pieces with clay, wood, stone, metal -- even glass. Weiler, highly regarded as a sporting artist, sculpts in stone and some bronze. "Holland Van Gores: Polychrome Turnings" features the artist's signature wood-turned vessels made with maple and milk paint. Van Gores, who lives in Pisgah Forest, has built an enthusiastic following throughout WNC since relocating from the Caribbean. He is represented by The Gallery at Flat Rock. The exhibits run through August 3. 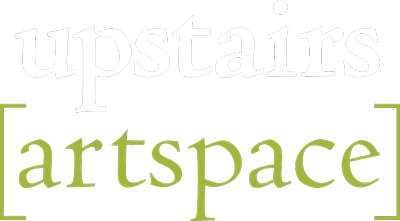 For information, visit www.upstairsartspace.org.